Patrick showed up on my doorstep the other evening with a great new toy: the GoPro Karma drone. We flew it around the neighborhood for a bit--and it is really nice. Much better than the inexpensive drone that I have. Mine is so light I don't even need to register it. 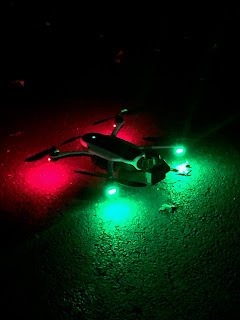 The drone flies so easily--GPS and gyro stabilized. It was a lot of fun, but a bit scary because of the trees. I have no idea what on earth I would do with it, but I do want one to play with. I think the gyro stabilized images will be awesome. I'm looking forward to some daytime images of the house from the air! Boys and toys. How true.